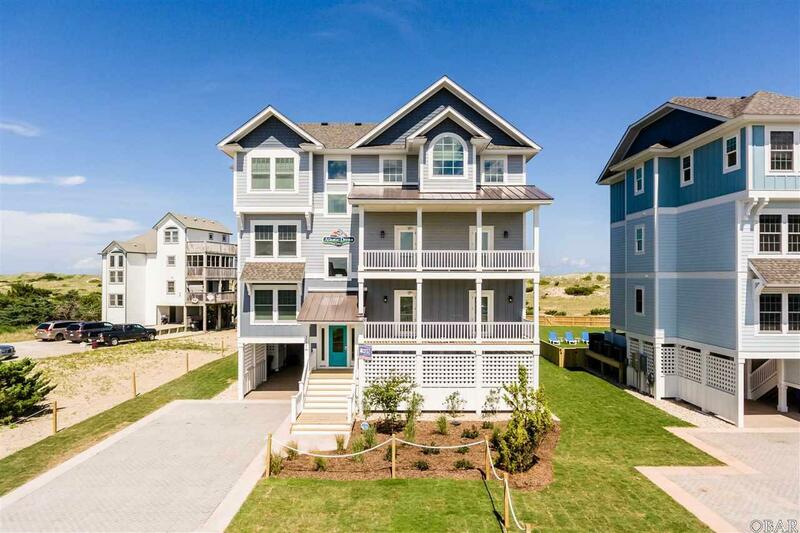 Atlantic Dream is a newly constructed oceanfront home that feels more like a resort. Your own private resort!! This All Master Suite home is large enough for your extended family vacation, a corporate retreat or a special event. The ground floor entertaining space offers a private dune deck and walkway to the ocean, outdoor entertainment deck with a custom 15' x 30' pool with integrated kiddie pool, terrace level bar and covered outdoor seating area. The ground level starts with a Kids Cave featuring arcade games, television and comfy seating. Not to worry - the adults get their own cave, complete with pool table, shuffleboard table and a wet bar with a big screen TV and plentiful comfy seating. This area also has an integrated partial kitchen, with full refrigerator, microwave and plenty of cabinets. A dedicated theater room, which features a variety of comfortable seating and a 90 in TV screen, along with a master suite round out the ground floor. The first level has wonderful outdoor space with two covered porches. In addition, this floor boasts 3 King Master suites, 1 Den with a Queen Sleeper Sofa, and 2 integrated bunk rooms that share 1 full bath. The laundry center is also on this floor. The second and third level is the focal point of the home. The stunning great room graces almost the entire top floor and it is a masterpiece of design and technology. It's strategic layout takes full advantage of the full glass wall overlooking the ocean. The kitchen is a chef's delight. Created with a large group in mind featuring 2 refrigerators, 2 dishwashers and 2 ovens, granite countertops, custom cabinetry and custom integrated breakfast bar seating. The oceanfront living areas feature two distinct gathering areas. The first is the conversation lounge, next is the entertainment area. The living area offers access to the oceanfront covered deck with views that never end. 2 King Master suites and 1 additional powder room complete this exceptional space.